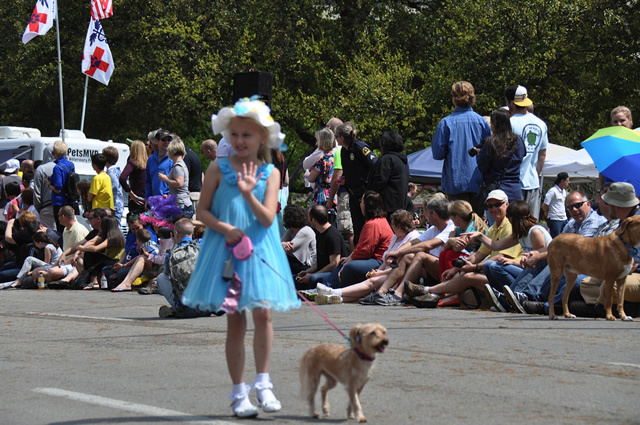 The Pooch Parade was a wonderful event. The weather was for little concern, for there was a lots of rain clouds. However the sun was persistent in creating a bright radiance in spite of the rain clouds. This made for a wonderful Easter celebration. All the diversity of dogs, their owners and people attending this incredible annual event made for a nice new beginning of spring. There were many dogs in costume, and everyone came together to celebrate the love we all have in common for these marvelous animals. It was quite an event, lots of animal organizations and animal causes. I want to say if you want to enjoy a fun time with friends, family and fellow Dallasites this is one I truly recommend for all animal lovers and pet owners of all kinds imaginable. This event truly makes for a unique and truly loving experience for everyone.